New Delhi: The home diagnostics market will grow at a healthy 3.5 percent value CAGR, surpassing US$ 6.3 million by 2026. According to the latest Fact.MR market research report, sales will remain buoyant in developed regions, with North America and Europe collectively accounting for over 50 percent revenue share of the market. 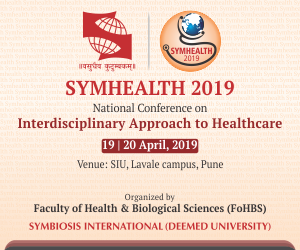 The study remains bullish on the prospects of home diagnostics market players in developing countries, as growing focus on health and wellness, and emergence of many Asian countries as medical tourism hubs creates opportunities. Increasing preference for self-diagnosis continues to be a trigger for home diagnostics sales, whereas a combination of industry-specific and regulatory factors continue to influence the strategies of market players. Governing bodies such as the U.S. Food and Drug Administration (FDA) and the European Commission regulate home diagnostics with stringent quality control regulations and labeling requirements. Gaining EU CE mark, FDA 510(k) clearance, and FDA approved Premarket Approval Application (PMA) continues to be a primary focus for home diagnostics manufacturers who are looking to scale up their presence in developed markets. For instance, Abbott Laboratories, a leading pharmaceutical company in the U.S., recently got an FDA approval for marketing its FreeStyle Libre 14 day Flash Glucose Monitoring system in the U.S. ACON Laboratories, another prominent player in the home diagnostics market announced that it has received FDA clearance of Mission U120 urine reagent strips. According to the report, compliance to ever-evolving regulations and gaining regulatory approval remains both an opportunity and challenge for market players. The study also finds that home diagnostics manufacturers are focusing on incorporating advanced technology to differentiate their offerings in the market. For example, Abbott Laboratories adopted next-generation sensor technologies to upgrade its FreeStyle Libre system (10 day) to the FreeStyle Libre 14 day Flash Glucose Monitoring system with improved accuracy and better mean absolute relative difference. Glucose monitoring devices will continue to witness robust demand and dominate the home diagnostics market with over than 80% revenue share in the market. According to the World Health Organization (WHO), the number of people suffering from diabetes reached 422 million in 2014, and it will soon become a leading cause of death. Increasing prevalence of diabetes worldwide and the growing need for monitoring sugar levels among diabetes patients is likely to boost adoption of glucose monitoring devices during the assessment period. 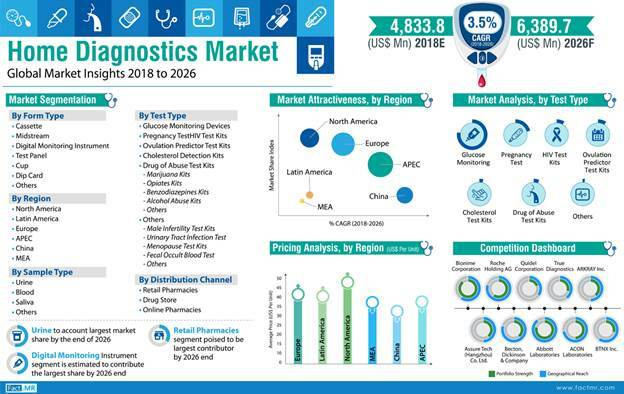 Home diagnostics market players are aware of the surging demand for glucose monitoring devices, and are focusing on increasing their product portfolio in this segment. The other lucrative segments in the home diagnostics market include pregnancy tests and ovulation prediction kits. According to the study, although demand for home diagnostics is concentrated in developed countries, home diagnostics market players are putting efforts to boost uptake in developing regions. Conferring to statistics published by WHO, the prevalence of diabetes has been the highest in middle and low-income countries. Anticipating the burgeoning demand for glucose monitoring devices in emerging Asia, players in the home diagnostics market are shifting their focus towards developing nations, including China and India. ARKRAY, Inc. – a Japanese manufacturer in the home diagnostics market – recently announced that it will strengthen its diabetes testing instrument production capacity in China. Leading manufacturers in the home diagnostics market are modifying their marketing strategies to improve awareness about cost-effective and efficient home diagnostics to leverage lucrative opportunities in the Asia-Pacific region.